Is time running out for Timeless...again? On a conference call with reporters on Sunday, NBC Entertainment's CEO Bob Greenblatt said the network will wait until after Timeless' season two finale airs before renewing or canceling it. Translation: Timeless fans better watch tonight! Timeless isn't the only NBC show still on bubble-watch, as Mindy Kaling's freshman sitcom Champions, which is still airing new episodes, is also still waiting to receive word if they will get a season two. 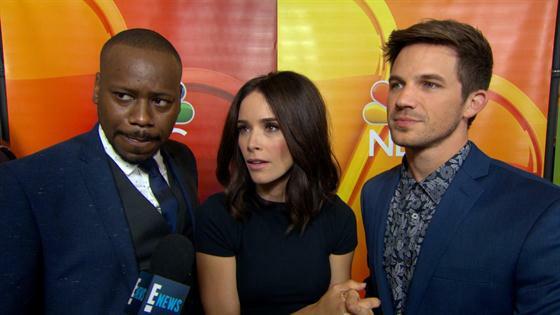 Timeless co-creator Eric Kripke took to Twitter on Sunday to urge fans to watch the two-hour finale, admitting he was "nervous" about the show's future. Timeless' finale airs tonight at 9 p.m. while Champions airs Thursdays at 9:30 p.m. on NBC.